“Would you like wine?” Luís said as he walked Rachel and I to the kitchen at Cooking Lisbon. We eagerly said “Yes, please!” and Luís handed us two glasses then told us to help ourselves, motioning to a chilled bottle on the table. “Have as much as you would like, we have plenty!” he said pointing to a wooden wine shelf filled to the brim with Portuguese wine. Rachel and I met eyes and smiled - it was going to be a good night. Cooking Lisbon is a culinary class about Portuguese cuisine that unites chefs, tourists and those that lack skills in the kitchen - AKA me - to learn how to make a traditional meal. The school has a variety of experiences; they offer cooking classes, market tours, seafood experiences, gourmet classes, pastry classes & food tours. We chose to take their three and a half hour gastronomy class to learn how to prepare a traditional Portuguese meal consisting of fish dish, meat dish and dessert. Portuguese cuisine has a variety of tasty treats that are inspired by their traditions of simple food, rich fish dishes and unbeatable sweet treats from the bakery. Fish lovers will rejoice here because Lisboetas are enamoured with bacalhau (or codfish). The love affair began hundreds of years ago during the Portuguese exploration of North America when travelers caught the fish off Newfoundland's Grand Banks and then salted and dried it to carry back home. It became such a staple that it remains a popular comfort food long after the need for salting has passed. Luís told us that we would learn to cook bacalhau in our class, but first, we could enjoy olive oils, fresh bread, cheeses and cured sausages as the other guests arrived. To give the sausage a beautiful charred flavor it was roasted over fire in front of our eyes. What a spectacular way to begin the class! Our first dish was Cod Fish Gomes Sá Style. Our master chef divided the class of 15 into pairs and we were each assigned a task to contribute to the dish. I was thrilled to only have to slice the potatoes - an easy task for an amature chef like myself. The dish was made with cod, potatoes, garlic, red pepper, bay leaves, eggs, olives, parsley and oil. To get the full recipe for this dish click here. As groups finished their assignments on the first course, the master chef assigned them new tasks: eventually moving into our second dish Chicken in the Pot. This dish had a little bit of everything and would be a great meal for a chilly night. 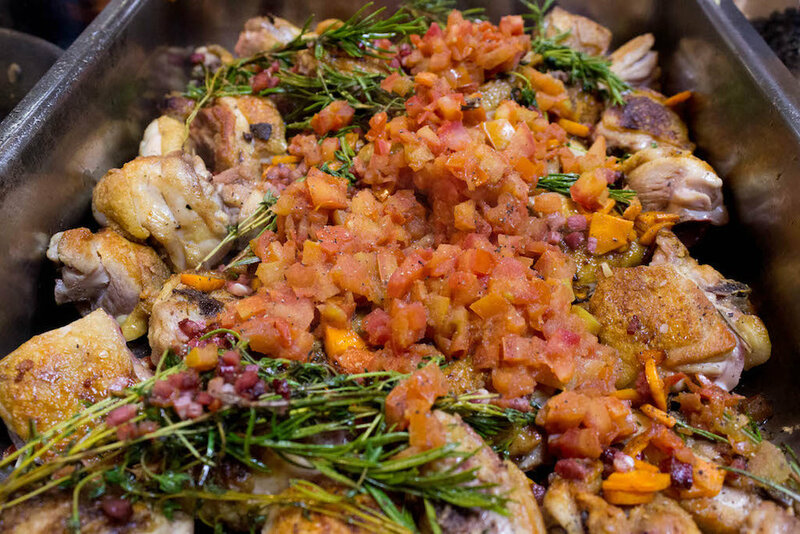 The main ingredients are chicken, potatoes, bacon (YES), onion, tomatoes, carrot, and garlic. This dish had a wine sauce and Rachel volunteered to help make that. While she was stirring away, I took it upon myself to supervise while drinking more wine - someone has to do it...hehehe To get the full recipe for this dish click here. As everyone was cooking, it was lovely to meet fellow foodies and chat about our experiences in Lisbon. I even met a couple who lived a few streets away from me in New York City! It is such a small world. To close out the meal, the master chef taught us how to make rice pudding - a staple dessert in Portuguese culture. The funny part was that the group that volunteered to help make that was from the UK, where rice pudding is also very popular. After comparing methods of cooking the same dish we all learned that rice pudding is made in different ways. The UK version of this dish is completely different than the Portuguese version. To see the full Portuguese recipe click here. It was finally time to feast! Our group of fifteen - many of which were new friends - sat at a long table together, sipped Portuguese wine and ate our meal. Its homemade quality made the experience more enjoyable than a typical dining experience. As I took a bite of each dish, images of how it was made flashed through my mind. We practically licked our plates clean and I was already thinking about the other Cooking Lisbon courses. The Portuguese have a sweet tooth and are known around the world for their famous pasteis de nata - crispy little tarts filled with egg custard. I suppose I’ll just have to take their baking course to learn how to make that one! We were guests at Cooking Lisbon, however, the opinions are our own. To learn more about their classes visit cookinglisbon.com. We took their three and a half hour cooking class. It was 70€ per person.